It’s nice to indulge in a whim now and then. Most times I go out on a walk I pretty much know where I’m going before I start, but now and then it’s good just to forget about route-planning and go for a wander. One day last year I was at Bob Scott’s on my own, on a none too brilliant day, and decided to follow the Lui down to the Black Bridge and then follow it back up on the other side. Going down the banks of the river, rather than the jeep track, gave the whole glen a different perspective, with the track out of sight just about the whole way down. 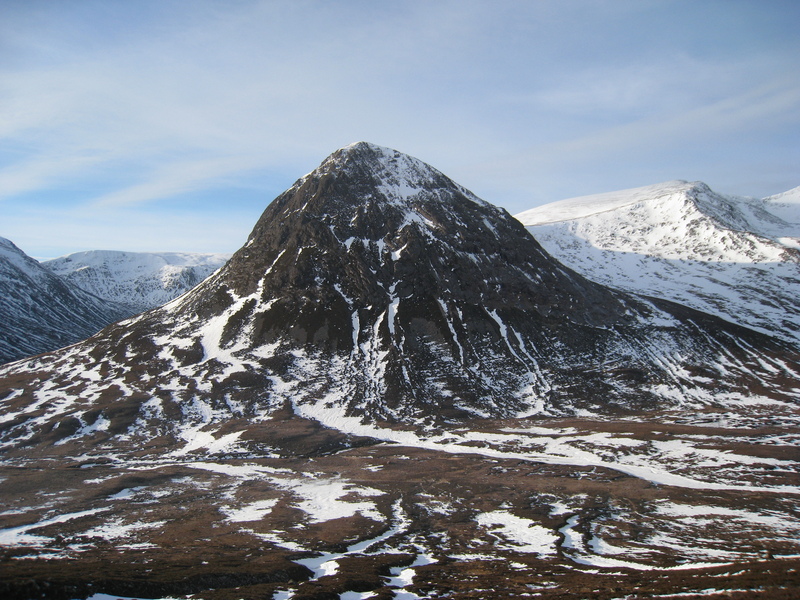 And if I took a detour up the hillside on the way back up the south bank – well, I was allowed to, covering lots of ground I’d never walked over before, even though I was so close to the main thoroughfare into the Cairngorms from the Braemar side. Did the same last weekend up the Derry Burn. Sunday was a lovely day, but I was feeling rather jaded after doing Beinn MacDui and Derry Cairngorm on the Saturday, so thought I’d leave the path and follow the west bank of the Derry Burn up beyond the Derry Dam. 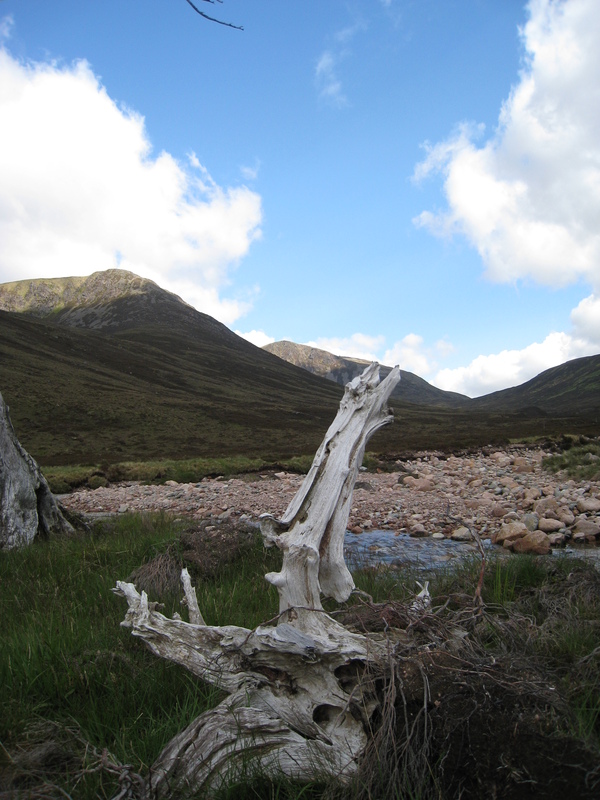 Of course, not having any plan in mind meant that, when I reached the end of the hill I had no return route in mind and ended up deciding to have a look into Coire an Lochain Uaine. 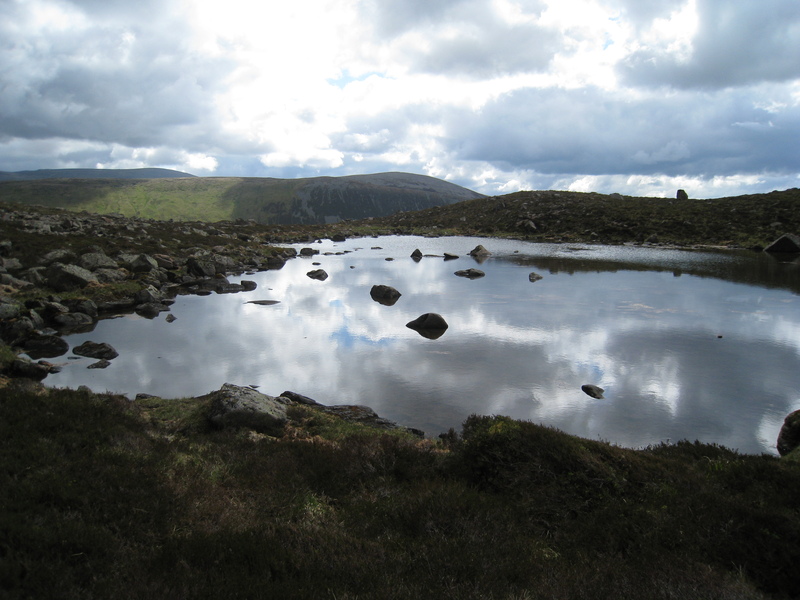 It’s a bonnie coire and I ended up at the back of it admiring the stream and then deciding that the easiest way back was probably up the steep backwall of the coire and over the top of Derry Cairngorm – where I’d just been the day before. Ah well, it was offering sunshine on Sunday: I’d had snow there on the Saturday. Some other ‘off road’ trips have ended up with repeat ascents recently. Since the end of last year I’ve been at least three times on top of Carn a Mhaim. 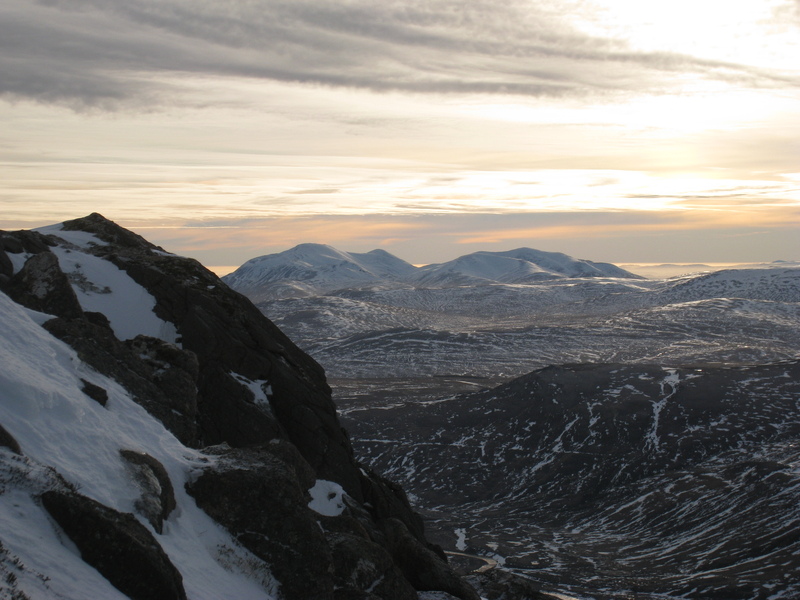 It started in December, when I’d just been out to Corrour with a friend and idly mentioned on the way back across the Dee that I’d always wondered about one of those long gullies on Carn a Mhaim’s west face. “You do it, then,” said my pal, so I did. The snow was in good nick and from the bottom it didn’t look any more than Grade I, so off I went, while he went the long way round back to Scottie’s. As it turned out, near the top it varied between ice and slush, and was about as steep as I care to tackle on my own and with just one axe, but there were some tremendous winter views on the way, and the sudden panorama when I topped out on the ridge was breathtaking: not a soul in sight across the whole of the Cairngorms. So when I was back at Corrour a few weeks ago, and looking for a wee bit variety on the return journey, it didn’t surprise me very much that I found myself (with full weekend sack) trudging up one of the gullies (The same one? Different? I really couldn’t remember) to see if it would go in summer. It did, although near the top it was rather steep, loose and wet for a while. An ice axe might have been handy! That might have been it, but a couple of weeks later I was back at Corrour to do some work with Neil Findlay. On the way back across the bridge it was Neil who mentioned he’d always fancied having a go at one of the gullies. Well, we had full weekend sacks on again but – what the hell? Why not? Definitely a different gully this time (although I’d meant to do the same one!) , it went slightly easier than a fortnight earlier, although, as if to make up for that, Neil managed to pick a line up a broken outcrop near the top, where some of the holds were of a rather temporary nature. 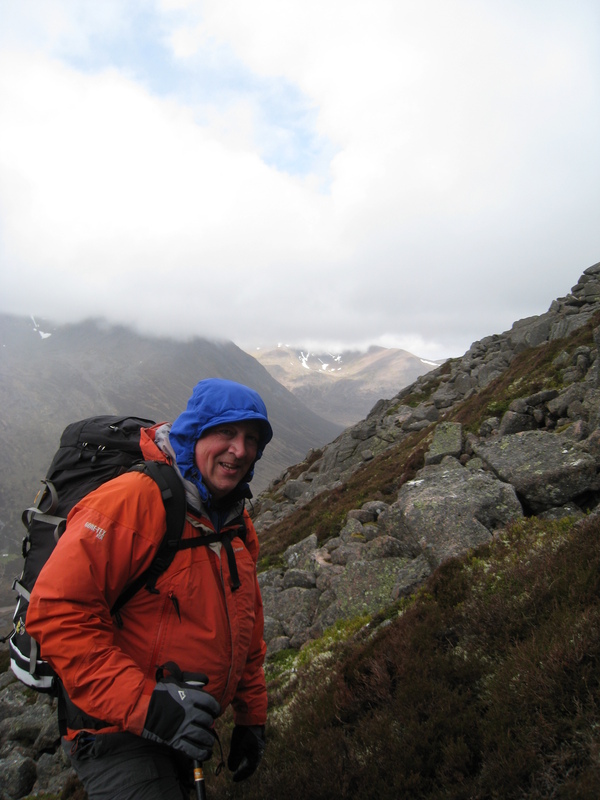 This entry was posted in Stravaiging and tagged Bob Scott's, Cairngorms, Carn a Mhaim, Corrour, Derry, Derry Burn, Derry Cairngorm, Devil's Point, Glen Derry, Glen Lui, Lui, wandering. Bookmark the permalink. 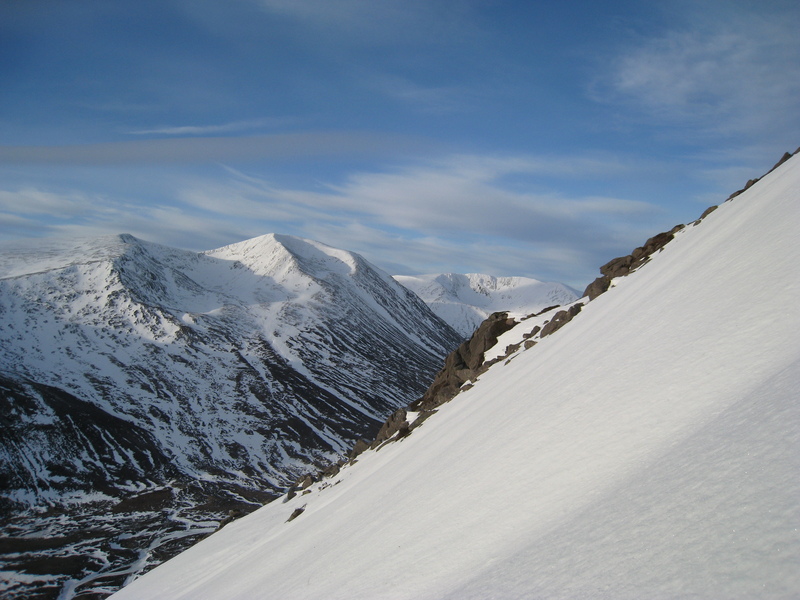 Great blog, whenever I see the snowbound title picture, or read one of your posts, I feel like I’m back in the Cairngorms. I’ve visited many mountain area’s, at home and abroad, but these hills really are something special. Like the blog Neil,keep up the good work!